Ian Warner's Self-Discovery Lessons on Making the Transition from Athlete to Entrepreneur | Arianna Merritt, M.Ed. I’m so excited that today, athlete and entrepreneur Ian Warner is empowering us all to #fuelpersistence through sharing his story, passions, and life lessons. Ian reached out to me through Twitter and after connecting with him through email, I had to invite him to share his story on The Self-Disovery Retreat. I love his passion for life and how he created a company with his brother, also a fellow athlete. Ian Warner grew up in Toronto, Ontario, where he attended the athletic powerhouse, Birchmount Park Collegiate. There he won provincials 8 times and earned himself an athletic scholarship to Iowa State. At Iowa State, he excelled as an entrepreneur by raising $150,000 from an angel investor. The same year as that investment, he became an NCAA All-American and made the 2012 Canadian Olympic Team. I love the concept of how you and your brother created “Athlete CEO.” Tell us the story of how you turned your passion into a career. I realized that there is not that much of a difference in what it takes to be a successful athlete, and a successful entrepreneur. I was also discovering that a lot of athletes hated having jobs because they were often too independent and used to living life on their own terms. We had already been running “Cover Ground,” but we decided it was time to also help athletes make the transition to entrepreneurship. I am actually making a bit of a shift with this (i.e., Cover Ground) though. I am going to be moving much of it over to a new platform, called “Bounce Back Entrepreneurs.” The site will be all about helping entrepreneurs to get through those really difficult stages. Cover Ground will go back to being much more focused on athletes’ training. Athletics runs in your family. Tell me, how did you start? My parents were both track athletes and body-builders when they were growing up. Once my brother and I got into grade school, they quickly realized that we both had talent that needed to be nurtured. They had parents who never saw any value in sports, so they decided to take a different approach. They used sports to encourage us to also work hard in school and build a great future. It all started playing football, as that was actually both of our first loves. We only started to run the 100m dashes to get us faster for football. Little did we know how much potential we actually had in the sport. As we got older, we realized that football would be a much harder sport to get a scholarship in so we pursued track instead. How did you develop the courage to rise to this platform and shine and continue to on a daily basis through performing and marketing yourself? My brother and I are really just doers; we don’t waste time thinking or making excuses why we can’t do something. For me, the courage part had more to do with putting my writing out there. I have a very creative mind but I don’t have the best grammar skills and I would often get ripped apart about that. I slowly got better though and I realized that I had more power than the haters because I was actually doing something. Mentorship and community are huge. My training group in high school all got scholarships because that was the expectation of the group. When one person left, it reminded everyone else that they too could accomplish that goal. You need to be around people who are doing what you’re doing. You also need to be around someone who is doing it bigger and better than you. I think a lot of people get intimidated by mentors or even just reaching out to people, but I really don’t understand why. The worst thing that will happen is that you will be ignored and that is not that bad. If I get ignored 10 times reaching out to people before I get 1 awesome connection, the 10 wastes of time were worth it. This is a tough one. One thing my parents always instilled in me was to be respectful to others and just have basic manners. I think I have had a lot of success because of leaving a great first impression with people. Many times I don’t even know what it is that people see because I just behave how my parents raised me. I like how you mentioned the importance of collaboration, especially as an athlete. Can there be collaboration in a competitive environment? Some sports administrators told me, “No.” How can we make competitive environments more collaborative? This is a HUGE issue I have with the athletic world. I do believe that you need to be competitive, but I think a lot of people underestimate the power of community and working together. It all comes from having a scarcity mindset where you believe that if someone else succeeds that there is no way that you can too. When you approach life knowing and understanding that there is abundance and God has provided us with everything that we need, it changes everything! I think athletes and coaches should work and think through problems together a lot more. There are too many egos that come into play though, and everyone wants to get the credit. If you can throw out who gets credit for success, you will be able to see the truth. The truth is that when we work with others we learn more effectively and we become more confident in our own ideas. There would be less injuries and the overall level of competition would rise. You create tools for athletes and entrepreneurs. What tool do you wish you had when you started as an entrepreneur and an athlete? Looking back I wish I listened to the right information. There is a lot of noise on the Internet right now. I wish I knew the power of connecting with others and that I don’t have to do everything myself. We connected through social media. It’s true, “As an athlete, your name and your image are your most important assets!” Can you elaborate more on this? 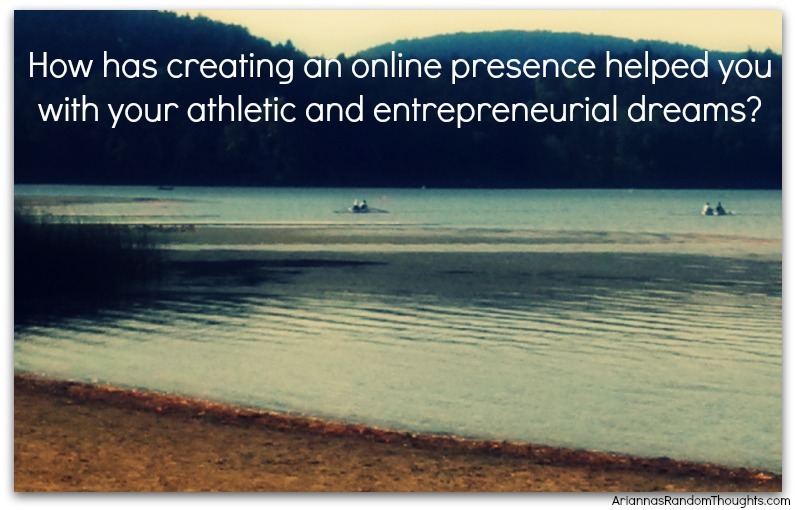 How has creating an online presence helped you with your athletic and entrepreneurial dreams? If you use social media to show others how you provide value to the world, you will always be able to make a living. A lot of athletes build these huge followings on social media from their popularity but they don’t know how to use that following! What a waste of an opportunity that is. Social media has done a few things for me. The first being that I get to connect with awesome minds like you all the time. The second being that whenever people look me up to see who I am, I have set up a brand that actually tells people what I am all about. I don’t have to explain who I am or what I do because these days you can figure it out on social media. What advice would you give to athletes to use social media to support them on their athletic journey? How has a website and strong social media presence helped you connect with potential sponsors and fans? What kills athletes the most is that they are often selfish. Think of the value that you can provide others first. This interview is a perfect example. I am writing on this to help you. My goal is to give your readers value and I am not thinking at all about them coming to my platform or promoting myself. In return, you agreed to be a guest on my podcast and you will provide even better value to my platform. You have to reach out to people and give and always look for the win-win. My social media presence has been huge in attracting sponsors to us because they see that we have built a following. What brands want is someone who will get them a lot of attention. If you have a large social media following, and you have a website that people visit a lot, that is valuable to a brand. What advice would you give new athletes and entrepreneurs about goal setting? Everyone is different in how they respond to goals, so I will say what works for me. I need to have a huge goal because I am a big believer in the fact that you rarely ever get more than you set out for. If your goal is to win a medal at the Olympics for example, you will probably finish 5th. Big goals always need to be accompanied by what I like to call the ‘baby step goals.’ You need to have smaller things that you can go after that just keep you on track for the big goals. I like to set a big goal and work backwards so that I have something I could accomplish today, tomorrow, next week, next month, and next year. Thanks so much, Ian, for this powerful conversation! I’m so grateful that you reached out to me and we connected. Your passion for sport and your commitment to supporting fellow members of the athletic and entrepreneurial communities reach their full potential shines through. You are making two very competitive environments more collaborative! Thank you all for reading and for your presence at this beach retreat. You rock! Did you learn something special from reading about Ian’s personal journey as an athlete and entrepreneur? Feel free to share in the Comments section below. We can all learn from hearing your stories and advice. As well, if you know of someone who could benefit from this interview, please pass it along and share it with them.